Use the Apply Peg Transformation module to apply a transformation coming from a Peg, Ortholock, or Quadmap module on a single module or a group of modules. 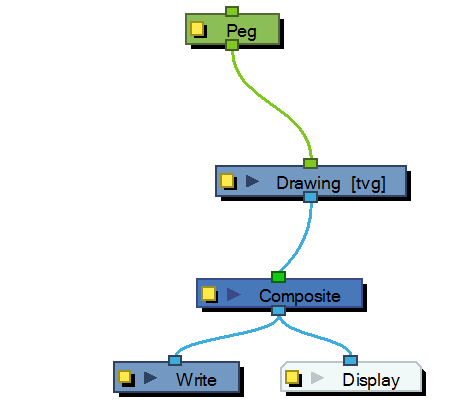 When using the drawing layer's No Clipping option, you can use this module to apply all Camera and Peg transformations once all of the effects and modules connected above the drawing module are calculated. You can use this effect module to create a simple highlight on a cut-out puppet or use the No Clipping option available in the drawing layer. The No Clipping option, found under the drawing Layer Properties' Advanced tab is used when you do not want to crop your images before all effects are applied to your drawing. 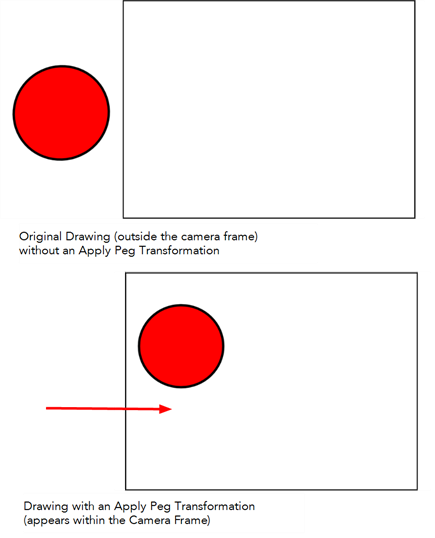 No camera motion or peg transformation will be applied to your drawing until you connect an Apply Peg Transformation. 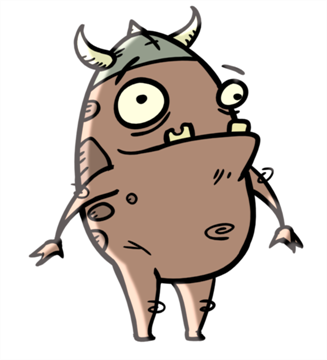 Refer to Positioning an Element Using the Layer Properties to learn more about the drawing layer's Advanced tab. The advantage of this module is that you can create a second output of your image or puppet and offset it, scale it or apply any kind of transformation on it. 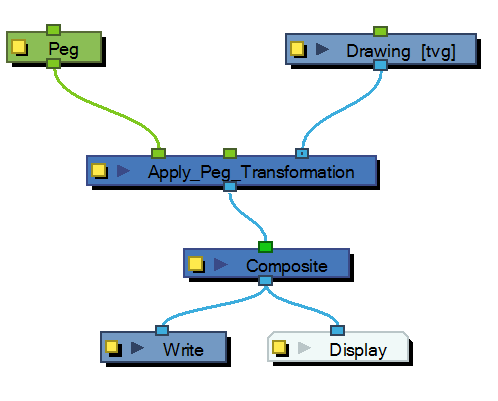 The transformations set in the Peg, Ortholock, or Quadmap module connected to the Apply Peg Transformation module are applied BEFORE the image is composited. Using the Apply Peg Transformation you can apply transformation on drawings that are outside the camera frame and make them appear inside the frame. 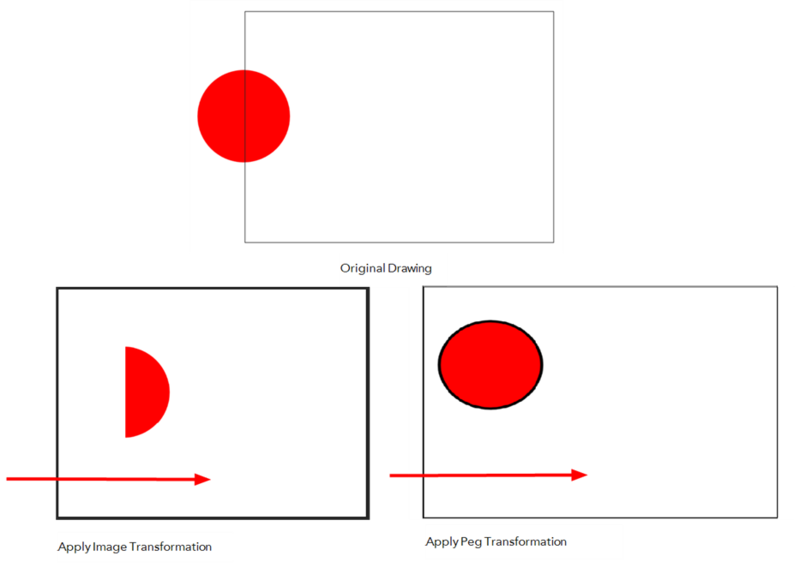 If you are using the Apply Image Transformation module to create a drop-down shadow for a character, it will work correctly so long as the character is not going outside of the camera frame or that the drawing connected in it is a VECTOR drawing. The reason is the Apply Image Transformation module applies the transformation once the drawing is rendered, moved by its own set of Pegs, motion paths and quadmap and cropped to the camera frame size. This crop operation does not occur if the drawing is a vector drawing (*.TVG). Although, as soon as the drawing is passed through an effect module or a bitmap type Composite module, the drawing is turned into a bitmap image and gets cropped. So, if you offset a bitmap half inside and half outside the camera frame, the outside part is cropped out and then moved by the Apply Image Transformation module. A part of the original drawing is cut. You need to use the Apply Peg Transformation module for the transformation to be applied before the image is processed and cropped.